What are the best Star Wars games for PC? There are plenty to choose from, and the quality is wildly variable. Thankfully – in large part to sheer weight of numbers – Star Wars has probably generated more great licensed games than any other film series. In the mood for a more generic brand of intergalactic adventure? Check out our rundown of the best space games on PC. Here’s the list… if you don’t spot one of your favourites, hit the comments and let us know. Star Wars: The Old Republic has always had a bit of an identity problem. One half of it tries to be a continuation of the Knights of the Old Republic single-player games, split up into several class stories that let you experience the Star Wars galaxy as a Chiss Imperial Agent or a Sith Warrior. The other half is the MMO half, and is pretty traditional. Those class stories, though, they’re worth going through the MMO stuff for. They’re ambitious, authentically Star Wars and often epic in scope, leading to things like joining the Sith Council. The latest expansion,Knights of the Fallen Empire, puts the focus almost entirely on this part of the game. Knights of the Fallen Empire is, essentially, a single-player game stuck inside an MMO. And it’s great, evocative of Knights of the Old Republic II even. It’s strange, the way that it tries to very hard not to be an MMO, but as the closest thing we have to a KotOR sequel, it really should be played. 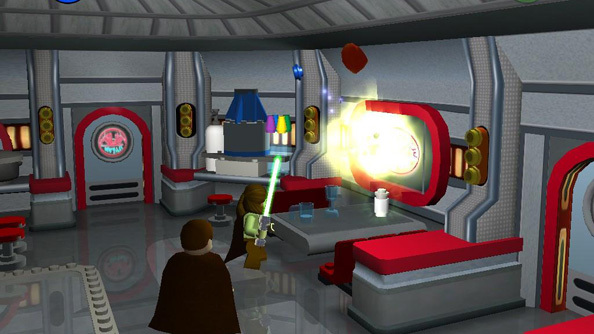 The original Traveller’s Tales Lego game, Lego Star Wars is proof that a great idea can live forever. The Complete Saga covers all six films, recreating the adventures of all key characters in blocky form, and asking that you break everything in your path on your journey towards defeating the Empire. Best played in local co-op, its gentle puzzles and good-natured humour make it a must play with your smaller family members. If you don’t hoard it for yourself, that is. And thanks to the custom character creator, you can make Boba Fett a Sith Lord. The first Knights of the Old Republic, which you may very well spot elsewhere on this list, was a fairly traditional Star Wars tale, despite its twists and turns. Its sequel, with Obsidian taking over from BioWare, is a bit more ambitious. It has all the trappings of a Star Wars romp – the lightsabers, the Force and its Light and Dark Side dichotomy, exotic alien words, wookies – but all of it is contained within a much bleaker, more philosophical narrative. And as much as it allows players to dabble in the Light and Dark sides of the Force, it’s an exploration of the grey area in between them. Don’t worry, it’s exciting too. Lightsaber duels, interesting new companions to recruit and, maybe, corrupt, making new enemies at every turn – it’s quite the space odyssey. Proof that not everything that came out the prequel trilogy was childish junk, Republic Commando is the Rainbow Six of the Clone Wars. Cast as special ops clone trooper RC-1138, you undertake missions accompanied by three other commandos, who can be bossed about with a variety of orders and context-sensitive commands. 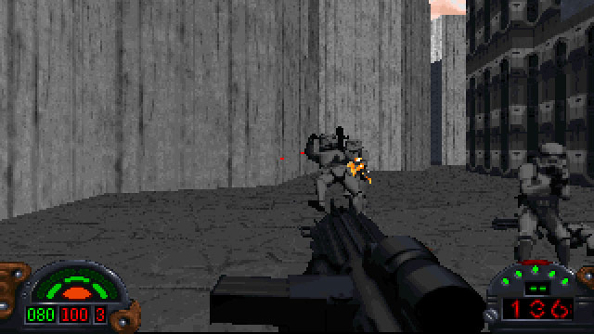 As influenced by Halo as it is Tom Clancy’s finest, the tactical nature of the game didn’t stop it from being a brisk run-and-gun. 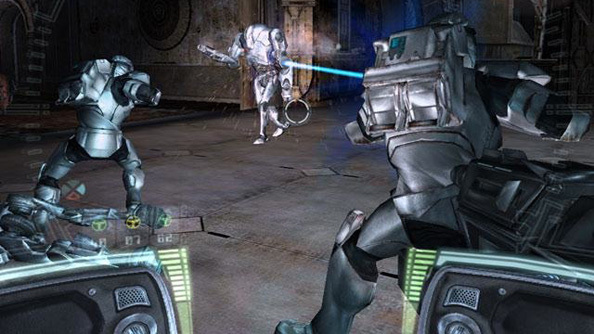 Frequently considered one of Star Wars’ most underrated games, Republic Commando is notable for being completely Jedi-less and trading epic combat for a grittier, ground-level feel. Entertaining touches like modular weapons, a wrist-mounted blade, and a visor wiper that brushed away enemy blood splatter ensures Republic Commando has a charm all of its own. The films have generally focussed on intimate struggles; Luke and Vader, Anakin and Palpatine, Han and Lando. Yet despite these one-on-one conflicts, Star Wars has always been set against the backdrop of a much larger war. The perfect setting for an RTS, then. LucasArts have published numerous strategy games set within the Star Wars universe, but Empire at War is easily its best attempt. Set between Episodes III and IV, Empire at War chronicles the escalating conflict between the Empire and the Rebel Alliance. A campaign map containing numerous planets adds an element of grand strategy, researching technologies in the downtime and establishing planetary defences. Battles can only be fought with troops taken into the fight, which ensures Empire at War has its own flavour when it could quite easily have been a Command & Conquer clone. 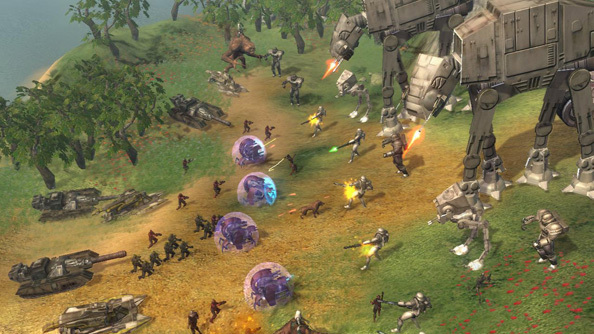 These skirmishes take place both on land using troops and vehicles and in space using cruisers and fighters, culminating in the classic assault on the first Death Star. Considering the vast amount of 3rd person action games that make up the bulk of the Star Wars games library, this is a solid and welcome change of pace. The X-Wing series is treasured by PC gamers for numerous reasons. Not only are they terrific at capturing the feel of Star Wars’ most exhilarating space battles, but they’re also surprisingly demanding space-sims that replicate some of the intricacies of flying fictional fighter craft through the deep inky black. X-Wing vs. TIE Fighter is the third in the series, and looking back it seems like it was parsecs ahead of the times. It’s a pure multi-player game, offering team-based competitive modes where each player fulfills a specific combat role. The Balance of Power expansion pack would later add a story campaign that can be played in co-op with eight players. 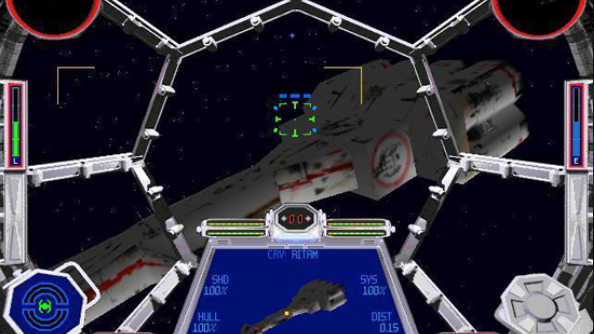 These features are the bullet points from the back of a late 2000’s shooter, but X-Wing vs. 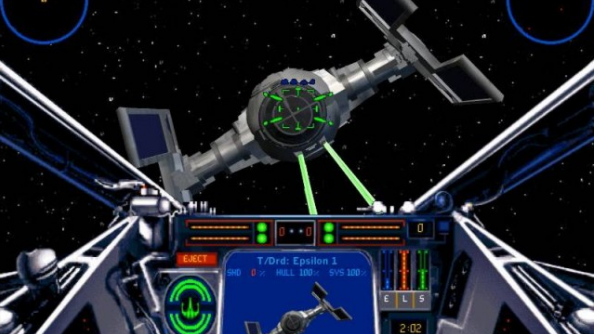 TIE Fighter came out in 1997, making it quite literally the most futuristic Star Wars game ever made. Kyle Katarn’s first adventure, long before he picked up a lightsaber, sees him doing covert work for the plucky Rebel Alliance and uncovering a dastardly Imperial plot to unleash a super army on the galaxy. Katarn’s mission? Shoot all the Imperials. At 20 years old, it no longer looks its best, but back in 1995, it was a way to experience Star Wars from a completely new perspective. The level design is also superb by the standards of any year, being elaborate and ripe for exploration in a way that modern linear shooters rarely are. Thankfully it’s also available on GOG and Steam, so you won’t have to hunt an ancient physical copy down. Whatever you think of Episode I, there’s no denying that its podrace was a tremendous spectacle and great insight into the sporting world of a far away galaxy. 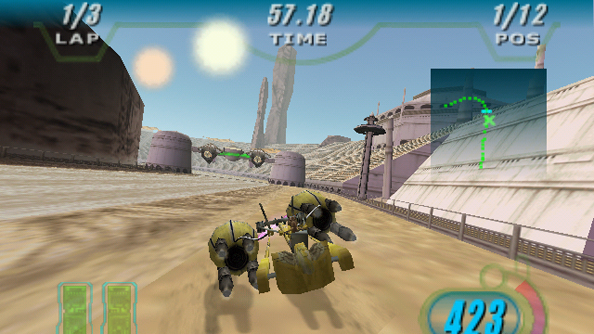 Episode I racer opens the scene into a whole game, with players taking on the role of one of the super-star podracers and embarking on a season of races hosted on numerous planets. Each planet’s track showed off the unique elements of its mythos, such as the Spice Mine Run on Mon Gazza that winded through the vast machine plants of a spice extraction facility. Winnings can be used to improve your podracer or purchase Pit Droids for enhanced repairs. New racers can be unlocked through play, with the ultimate prize being Sebulba with his rival-toasting flamethrowers. The podracers themselves really benefit from the use of licensed sound effects from the films, and whilst it may be an ugly game by todays standards, Racer really does sound like a genuine podrace. The second game in the Dark Forces series but also the first Jedi Knight game, Jedi Knight: Dark Forces II sees Rebel mercenary Kyle Katarn embark on a revenge mission to bring the Sith who killed his father to justice. Katarn is one of the Expanded Universe’s greatest characters; abandoning the Empire to fight for the Rebel Alliance in the original Dark Forces game, the sequel sees his greatest transformation: from gruff gunslinger to a powerful Jedi. 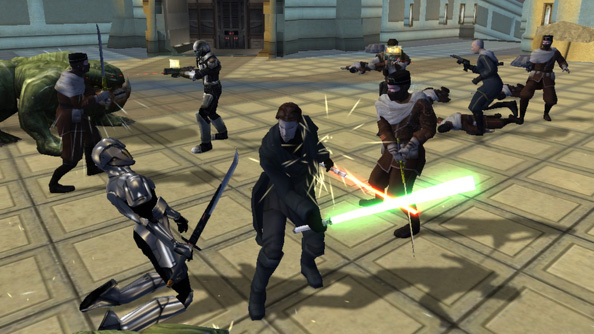 The change saw the game’s FPS gunplay mixed up with lightsaber combat, and added an impressive array of Force powers too. What’s more Dark Forces II also has a morality system, and your actions against non-hostile characters determines whether you’ll slip into darkness or remain on the true path of the Jedi. It’s all black and nothingness out in space. For the real scenic view from an X-Wing cockpit, try swooping over one of the galaxy’s many scenic planets. 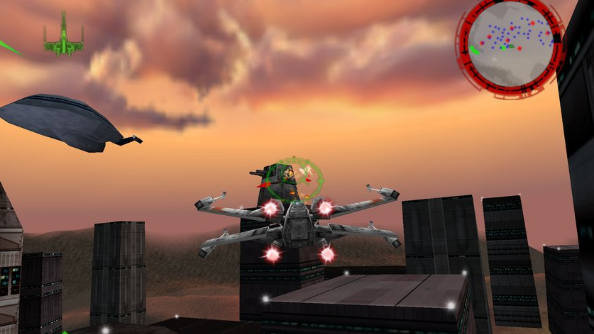 That’s where Rogue Squadron takes you; a flight game that takes place firmly within atmospheric confines. You may be a little less free than you are in the space-sim X-Wing series, but this doesn’t stop Rogue Squadron being a stellar flyer. The arcade-feel keeps things fast and tight, easily swooping over ground targets and riddling them with blaster fire, and engaging in violent chase sequences with TIE Fighters. The craft collection is small but the X-Wing, A-Wing, Y-Wing, V-Wing, and Snowspeeder all have their own unique characteristics, making mission replays vastly different in feel if not events. Hailed as the finest Star Wars multiplayer FPS, Battlefront II is what happens when you take the Battlefield formula and inject it with some LucasFilm magic. 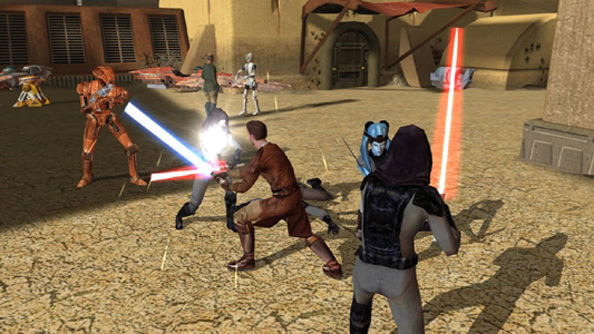 Split across both generations of Star Wars, players take part in some of the most iconic battles of the Clone Wars and the Galactic Civil War. Four player classes split sides into distinct combat roles, and a strong collection of vehicles ensures there’s plenty of variety in the way you can blow the opposition to bits. Battlefront is majorly focused on frontline combat between grunts, but the sequel brought Jedis and other such legendary types to the fold. Cleverly preventing everyone diving on a lightsaber, Jedis are only unlocked after the team scores a set amount of points. It makes their presence on the field feel a little more special, provided of course the player in control knows how to swing a blade. A victim of the GameSpy shutdown, it would appear that you can no longer engage in Battlefront’s multiplayer modes. Not so, though: GameRanger will help you through such troubles and let you continue the fight. The series has also been resurrected by EA and DICE, and the new Star Wars Battlefront is due out very soon. If you’d rather take to the skies on your own, then TIE Fighter is the route to take. It’s unfolding narrative is frequently cited as one of the best Star Wars tales around, and that’s certainly down to the tone it takes. Rather that sniggering like an evil villain, the Imperial forces in TIE Fighter genuinely believe they’re fighting an army of terrorists, and playing as a TIE Fighter pilot never feels like being ‘the bad guy’, but rather an important cog in the machine that will crush a threatening insurgency. Aside from the great story, TIE Fighter lets you strap into the cockpit of one of sci-fi’s greatest ship designs, and operating it feels every bit as cool as you’d expect. You also get to fly alongside the Dark Lord himself, which lets face it is in everyone’s top five Star Wars fantasies. Prequel can be a bit of a dirty word in Star Wars circles. 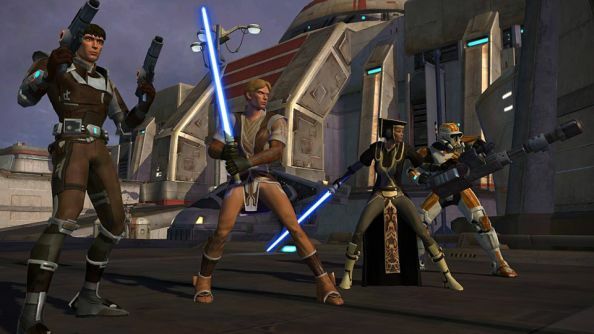 Prequel prequel however is a reason to celebrate, because it means you’re talking about BioWare’s Knights of the Old Republic, the seminal RPG set 4,000 years before the rise of the Empire. Based on the old d20 ruleset, KOTOR is essentially Dungeons & Dragons: Star Wars edition, and is every bit as brilliant as that sounds. 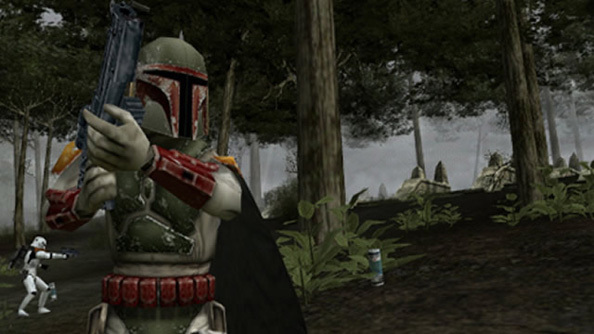 A rich universe that delved deep into aspects only hinted at in the core films (Boba Fett’s descendants the Mandalorians feature heavily), the game was set during the Republic’s heydays. The threat of a Sith warrior known as Darth Malak hangs heavy in the air, made worse by the fact that he’s the apprentice of Darth Revan; a shadowy unseen power who’s Vader, Sauron, and Voldemort combined. As with any BioWare RPG, it’s your job to stop him, and you’ll join a team of Jedis, smugglers, pilots, and mercenaries on your journey, as well as taking command of your own Millenium Falcon-wannabe the Ebon Hawk. Knights of the Old Republic is brilliant for many reasons; its strong cast, great use of the license and its packaged sound effects and music, strategic party-based combat, and some lovely visuals for the time. But ask anyone what the best thing about KOTOR is, and they’ll instantly talk about a very specific plot point. Even now, 11 years after launch, I refuse to write it down for fear of destroying one of gaming’s best narrative sucker punches. But if you’ve played KOTOR through, you’re already well aware that its tale is better than most of George Lucas’ scripts. 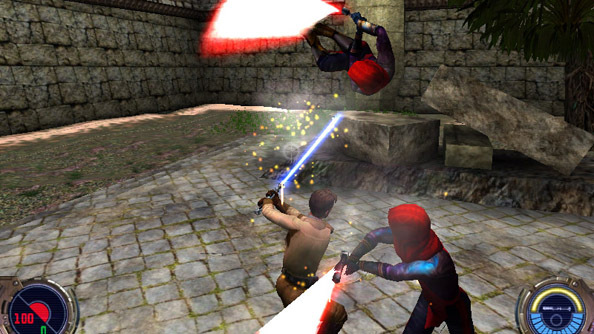 Kyle Katarn returned to the PC in Jedi Outcast, the finest Star Wars experience ever crafted. Treading a similar path to its predecessor, Kyle once again must progress from mercenary to Jedi due to cutting ties with the Force after almost falling to the dark side. 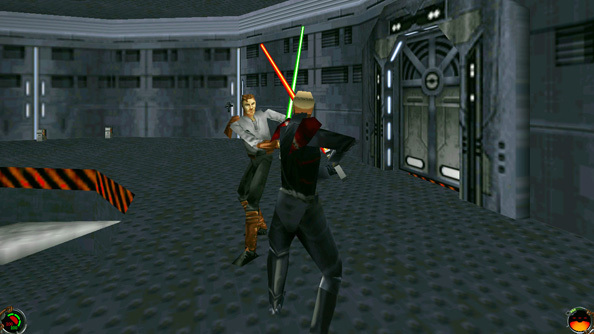 Built on the Quake III engine, the shooting is naturally solid, but it’s the lightsaber combat that really marks Jedi Knight II as a masterpiece. Being able to cycle between light, medium, and heavy combat stances offers a depth to lightsaber combat that hadn’t been seen before, and to date has yet to be beaten. Duels felt intense and evoked the awe that the film’s best clashes inspired. Even cooler was if you inputted the ‘saberrealisticcombat’ cheat code into the game’s console. Suddenly saber swings would slice off limbs and heads, leaving hissing cauterised stumps. Even accidentally walking past people with the blade extended would cut them down. Combined with Force abilities that felt every bit as powerful as they looked and a path of progression that saw you become ever more competent with your abilities, Jedi Knight II is the true, unrivaled Jedi sim.